At BBC we aim to be a church in the community for the community. We aim to be a welcoming, friendly, contemporary church for all ages and family dynamics. We seek to follow Jesus and bring His love, hope and peace into the community through our words and actions. We enjoy providing programs for all ages: playgroup, kids, youth, young adults & families. We encourage Bible study groups, support groups and involvement in community groups. 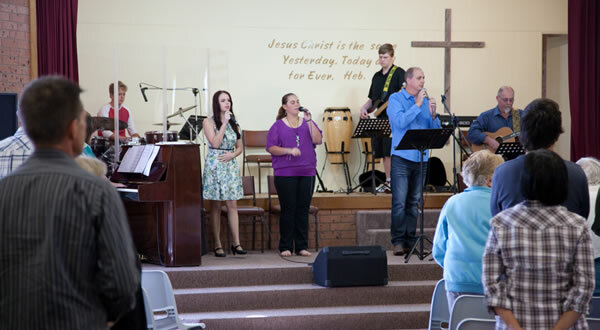 Our Sunday services are a relaxed, Bible-based approach to worship. Children enjoy their own Kid's church program and we have a Parents Room with a video link to watch the sermon. There is also a crèche for toddlers. After worship there is morning tea for the kids and great cappuccinos and other refreshment for adults. The evening service focuses upon youth, young adults and the young at heart. Come and meet us at any of our activities, we'd love to meet you! If you'd like further information, please contact our office on 6332 2345.